To Cite: Nabavi N, Mosallanezhad Z, Haghighatkhah H R, Mohseni Bandpeid M A. 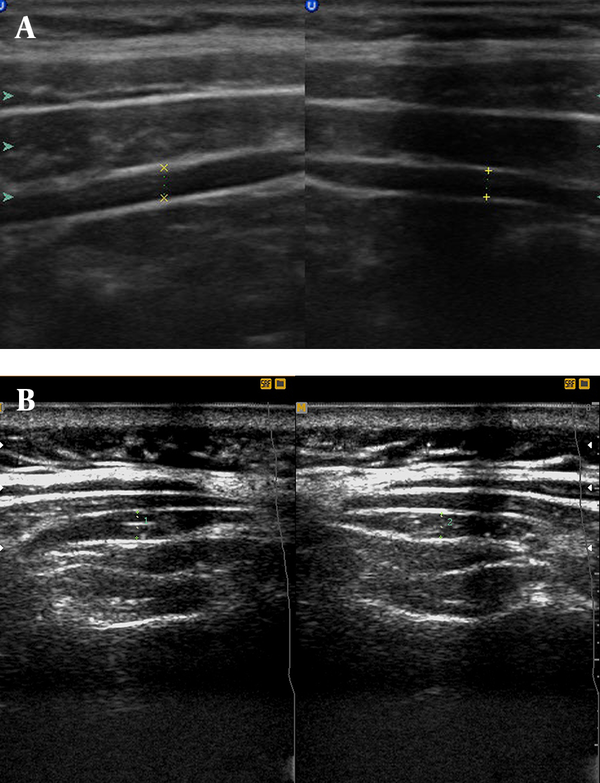 Reliability of Rehabilitative Ultrasonography to Measure Transverse Abdominis and Multifidus Muscle Dimensions, Iran J Radiol. 2014 ; 11(3):e21008. doi: 10.5812/iranjradiol.21008. Background: Lumbar paraspinal muscles play an important role in providing both mobility and stability during dynamic tasks. Among paraspinal muscles, transverse abdominis and lumbar multifidus have been of particular interest as active stabilizers of the lumbar spine. These muscles may become dysfunctional in chronic low back pain (CLBP). Low back injury can result in muscle inhibition and control loss that cannot recover spontaneously, and specific exercises are required to stimulate their recovery. Objectives: The purpose of this study was to test the reliability of ultrasonography to measure muscle dimensions and to present a reliable method for measuring transverse abdominis and lumbar multifidus as stabilizing muscles of the lumbar spine. Patients and Methods: Fifteen healthy participants (18-55 year olds) were evaluated by a radiologist using Sono made in Canada. (ES500) with two probes (50mm linear 7.5 MHZ and 70 mm curvilinear 3.5 MHz). The muscle thickness of transverse abdominis and the anterior-posterior diameter and cross sectional area of the LMF were measured. To determine within and between days reliabilities, second and third measurements were repeated with half an hour and one week intervals, respectively. Results: Intraclass correlation coefficient for left and right showed good to high reliability for the cross sectional area of lumbar multifidi (0.74 and 0.88, respectively) as well as the anterior-posterior dimensions of lumbar multifidi (0.89 and 0.91, respectively) and transverse abdomini thickness (0.73 and 0.85, respectively). Conclusions: Rehabilitative ultrasonography is a reliable and non-invasive instrument to measure muscle thickness. The method used in this study is a reliable way to measure lumbar stabilizing muscles. Lumbar paraspinal muscles play an important role in providing both mobility and stability during dynamic tasks (1). Among paraspinal muscles, transverse abdominis (TrA) and lumbar multifidus (LM) have been of particular interest as active stabilizers of the lumbar spine. These muscles may become dysfunctional in chronic LBP. Low back injury can result in muscle inhibition and control loss which cannot get recovered spontaneously (2), and specific exercises are required to stimulate their recovery (3). Different methods are available to assess the function of these muscles and also to evaluate the effectiveness of rehabilitation programs (4, 5). Rehabilitative ultrasound imaging (RUSI) can be used to assess muscle activation by measuring the change in muscle geometry during contraction. The most common measurement utilized to assess muscle activation is change in muscle thickness (6). Muscle thickness change has been shown to represent muscle activation by simultaneous EMG recording from the TrA muscle (7, 8), and the LM muscle (9) in normal subjects. 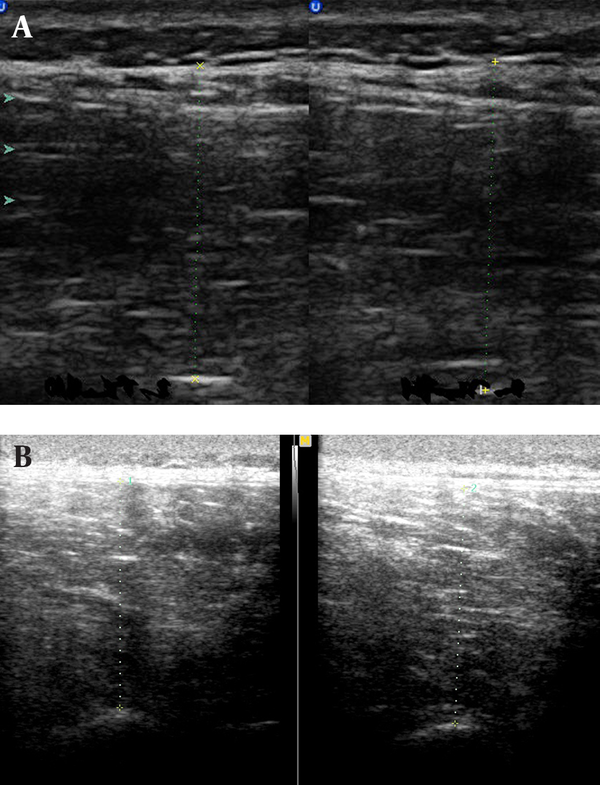 Few studies in Iran have showed the reliability and validity of ultrasonography for quantitative evaluation of lumbar and abdominal muscle thickness. The purpose of this study was to determine the within-day and between-days reliability of ultrasonography in measuring muscle thickness and to present a reliable way to evaluate the TrA and LM muscle thickness. The ethics committee of the University of Social Welfare and Rehabilitation Sciences approved the study. Of healthy adults, 15 individuals (two female and thirteen males) aged 18-55 years with no history of low back pain, no spinal deformity, and no history of neuromuscular, musculoskeletal and cardiopulmonary diseases were included. All subjects were informed about the study and signed the consent form. Ultrasound images were obtained using Sono made in Canada. (ES500) with two probes (linear 7.5 MHZ and curvilinear 3.5 MHz). The TrA was measured in supine hook lying position with the hand under the head. The linear probe (7.5 MHZ) was placed at the level of the axial line between the iliac crest and the 12th rib and removed until the medial border of the muscle (Figure 1) was seen in the far medial of the screen (10). At the end of expiration, the image was fixed and saved (11). The anterior-posterior dimension of the LM was measured in the prone position (on a standard plinth to decrease the lumbar curve) and at the L5 level (Figure 2). The L5 spinous process was identified by palpation and marked for reference. The linear probe was placed longitudinally along the spine, moved laterally, and then angled slightly to the medial until the L4/5 facet joint could be identified. This scan point was directly over the LM. The distance between the above landmark and the subcutaneous tissue at the end of expiration was considered as the LM thickness (11). The cross sectional area of LM was measured at L4, because the image of this level was more clear than L5 using a curvilinear 3.5MHZ probe. The transducer was placed transversely over the spinous process of L4. Simultaneously, the measures of the left and right multifidus were obtained (Figure 3). All measures were taken three times; the first and second were performed in one day with a half an hour interval (for within day reliability), and the third was performed after a one week interval (for between days reliability). Figure 1. 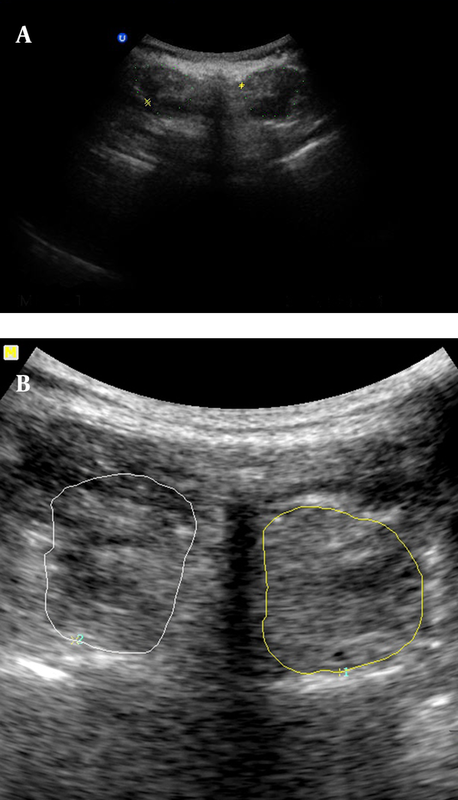 Sonograms of right and left Transverse abdominis. Figure 2. Anterior-Posterior dimension of Lumbar Multifidus. Figure 3. Cross sectional area of Lumbar Multifidus. Intraclass correlation coefficients (ICC) and standard error of mean (SEM) were used to assess within-day (between the first and second measures) and between-days (between the first and third measures) reliabilities. Means and standard deviations (SD) of the age and BMI of the participants were 27.13 ± 10.13 and 23.80 ± 4.16, respectively. For the first measurement, the mean and SD were obtained as (3.45 ± 1.02) and (3.30 ± 0.80) for the right and left TrA thickness, respectively; (26.07 ± 5.14) and (26.89 ± 5.36) for the right and left LM thickness, respectively and (4.29 ± 1.024) and (4.38 ± 1.12) for the cross sectional area of the right and left LM, respectively (Table 1). ICCs ranged from 0.68 to 0.94 and SEM values (Table 1) confirmed good to high reliability for within and between days’ measures. The present study confirmed that B-mode ultrasonography and the method used in this study to assess TrA and LM can provide reliable measures of muscle dimensions in asymptomatic people. Previous investigations have also achieved the same conclusions (12, 13). In line with our result, the reliability of M mode ultrasonography of the abdominal muscles in different positions in asymptomatic subjects has been reported by Bounce (14). Furthermore, an Iranian study has confirmed that ultrasonography imaging may provide reliable measurements of abdominal muscle thickness in acute low back pain patients (15). Our data support previous suggestions regarding the site where TrA thickness can be imaged and reliably measured (10). The authors underlined that although ultrasound imaging is a reliable tool to measure muscle size, the interpretation of the size changes to muscle activation should be done conservatively. It means more studies are needed to confirm using ultasonography to evaluate muscle activation during high levels of contraction, during concentric or eccentric contractions, or during the tasks that have not been validated (16). Richman et al. (17). suggested reliability coefficient values of 0.80 to 1.00 as very reliable, 0.60 to 0.79 as moderately reliable, and 0.59 or less as questionable reliability. These support that our measures have obtained good to high reliabilities. To improve the generalizability of the results, we suggest the same study considering a longer time interval, larger sample size and also comparing the results between healthy people and patients. We also suggest evaluating the reliability of sonography in measuring other muscles. Comparing different protocols to find the most reliable way to evaluate TrA and LM are also suggested. Our limitations in this study were the small sample size, using only healthy participants and the short time in measurement intervals. Rehabilitative ultrasonography can be used in clinical setting to measure muscle dimensions as a reliable and non-invasive instrument. The method used in this study is a reliable way to measure lumbar stabilizing muscles. This study was part of a larger study supported by the Department of Physiotherapy, University of Social Welfare and Rehabilitation Sciences (USWR), Tehran, Iran. We hereby thank all participants and experts who contributed to this study.